Soot Pollution in the Arctic Soot from diesel engines and oil-burning power plants pours into the atmosphere around the city of Murmansk, Russia during the winter season. Working to reduce soot emissions is a goal that will help clear the atmosphere, reduce health effects from air-borne pollution, and ease climate impacts on the Arctic. Understanding where soot emissions come from and how measures to reduce diesel engine soot emissions are working will guide next steps for researchers, air quality managers, and manufacturers. Photo courtesy of the authors. Enlarge Image. Results: Engines that burn diesel can spew a large amount of pollution containing soot particles. These particles have an impact on health and climate in some of the world's most sensitive regions. Researchers at Pacific Northwest National Laboratory developed a detailed inventory of Russian diesel soot emissions in cooperation with Russian partners. The research, which separated on-road vs. off-road engine emissions, found that on-road diesel vehicles emitted 42 percent of all black carbon (soot) emissions from diesel sources in 2014. Of that 42 percent, heavy-duty trucks account for 60 percent and cars only 5 percent. Off-road diesel engines (i.e., generators, agricultural and industrial equipment) contributed 58 percent of all diesel black carbon emissions. "Our research found that even though on-road vehicles consumed 73 percent of the diesel fuel in the country, they produced only 42 percent of soot emissions," said Nazar Kholod, PNNL postdoctoral researcher working at PNNL's Joint Global Change Research Institute (JGCRI) in Maryland. "This research indicates that recent implementation of emission-reduction standards for these vehicles is helping to reduce their soot emissions." The research concludes that better understanding diesel soot emissions can help inform policy and minimize climate impacts. Why It Matters: Ever seen that puff of black smoke blasted from a diesel engine? It's full of gritty soot. Burning diesel is a major source of soot emissions in many regions. Soot emissions (also called black carbon) can have an outsized impact on climate change, especially in the Arctic. The black particles are notorious for soaking up sunlight and when blanketing a snowy white region like the Arctic, warming the surface and melting the ice and snow. Black carbon is not only a major climate pollutant, but is a concern for human health as well. Russia contains the majority of the Arctic lands within its borders and the region has an important global climate role. Arctic sea ice keeps the polar region cool and helps moderate the global climate by reflecting a large amount of the sun's energy back into space. The loss of Arctic ice and snow means there is more dark ocean and land surface soaking up sunlight energy, warming the region and contributing to sea level rise around the globe. The results of this study can play an important role in helping scientists understand how soot affects the global climate. They can also help in estimating the health impacts of soot. "There are well-proven strategies and technologies to reduce diesel emissions," said Meredydd Evans, PNNL researcher and principal investigator of a project to estimate black carbon in the Arctic. "Better understanding of emissions may lead to policies that reduce the climate-warming effects of diesel. These examples from Russia provide helpful information on how other countries may also seek to reduce emissions." Methods: In this study, researchers from PNNL's JGCRI and their collaborator from the U.S. Environmental Protection Agency performed an in-depth study of Russian diesel use, driving patterns, and diesel equipment across their economy. The study showed significantly lower emissions than previously estimated. The differences were due to precise accounting methods and policy changes in Russia requiring low-emission vehicles. 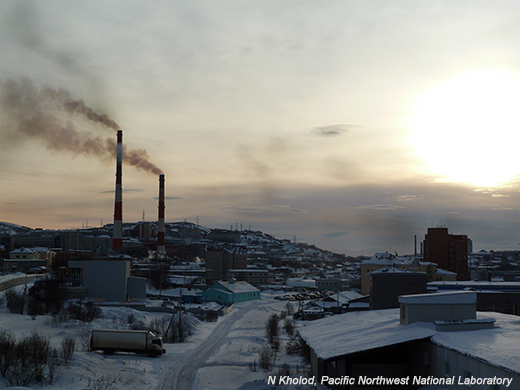 PNNL researchers used state-of-the-art inventory methods to estimate Russian emissions. This involved collecting and comparing multiple sources of data on Russian diesel consumption, vehicle registries, traffic volumes, and emission controls. The scientists also looked at diesel use in industry, agriculture, construction, and other sectors, developing detailed data on equipment and use patterns. They processed the information using several inventory models, which they adjusted for Russian conditions. What's Next? 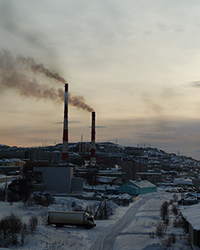 The research team is working on a review of all of Russia's black carbon emissions. This will provide a much clearer picture of Russian emissions for climate models and for making decisions. Research Team: Nazar Kholod and Meredydd Evans, PNNL's Joint Global Change Research Institute; Teresa Kuklinski, U.S. Environmental Protection Agency's Office of International and Tribal Affairs. JGCRI is jointly sponsored by PNNL and the University of Maryland. In one sentence: PNNL calculated a detailed inventory of Russian diesel soot emissions and found that on-road diesel vehicles emitted 42 percent of all black carbon (soot) emissions from diesel sources in 2014 and off-road diesel engines contributed about 23 percent of all soot emissions sources.